TX-TRAILERGUARD, the next-generation Fleet Management Solution (FMS) of Transics International, a WABCO company and full solution provider for truck, driver, trailer, cargo and subcontractor management, is now available on the market. For the first time, TX-TRAILERGUARD, enables a real-time monitoring of the trailer showing all relevant information in addition to truck- and driver-related data, generated by the truck’s on-board computer, onto a single screen on the fleet manager’s desk. With TX-TRAILERGUARD, trailer-related data such as axle load, tire pressure, temperature inside a refrigerated trailer and door status among other operating functions can be transferred to the back office, where they are fully integrated into TX-CONNECT, Transics’ back office software. Thus, unlike common individual applications, it bundles all relevant information on the performance of the whole truck, trailer and driver in real time onto a single screen. Thereby, fleet managers can identify potential issues such as recurring overload, structural underutilization and inappropriate driving behavior. Thanks to management reports which give a clear overview of the vehicle performance, they can help to optimize planning and capacity investments. In addition, when the truck is equipped with Transics on-board computers, dispatchers can instantly provide technical and administrative feedback to the driver – for example on next orders or potential hazards such as underinflated tires. Fleet managers may provide guidance and assistance to drivers on the road, thereby enhancing the vehicle’s safety, improving customer service and reducing downtimes as well as maintenance costs. The first customers such as the Dutch transport company Keus & Mollink, who recently equipped their entire fleet with TX-TRAILERGUARD, already benefit from this new solution. Via Transics’ on-board computers, the drivers also have direct access to relevant data such as the actual temperature in the trailer and thus can respond quickly when needed. The Transics solution provides Keus & Mollink with a direct link between trucks, drivers and its home office. Henk-Jan Keus and Jenita Keus-Mollink started their company Keus & Mollink BV in November 1998, in the city of Almelo. The company was born from passion and covered just a few square meters. In a few years, Keus & Mollink developed into a successful international company with over more than 30 trucks and a large network of customers. Keus & Mollink specializes in livestock transport. Right from the beginning, the company focused on the transport of various animals such as cattle, calves, pigs, piglets, sheep and goats. Keus & Mollink is a reliable, flexible partner for the transportation of live animals in the EU and also outside the EU. Transport company Keus & Mollink stands for fair and reliable service and making it all possible. 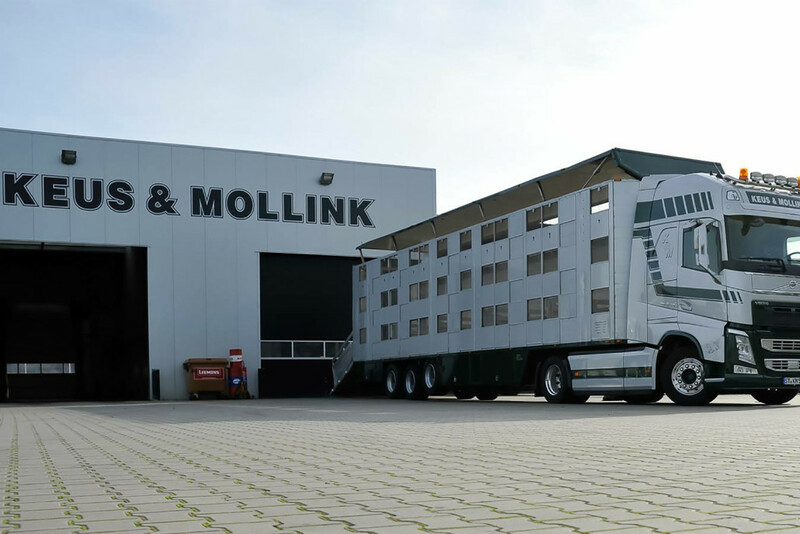 Along with its company size and a widely spread work area inside and outside Europe, Keus-Mollink can only be the best choice for your livestock transports.